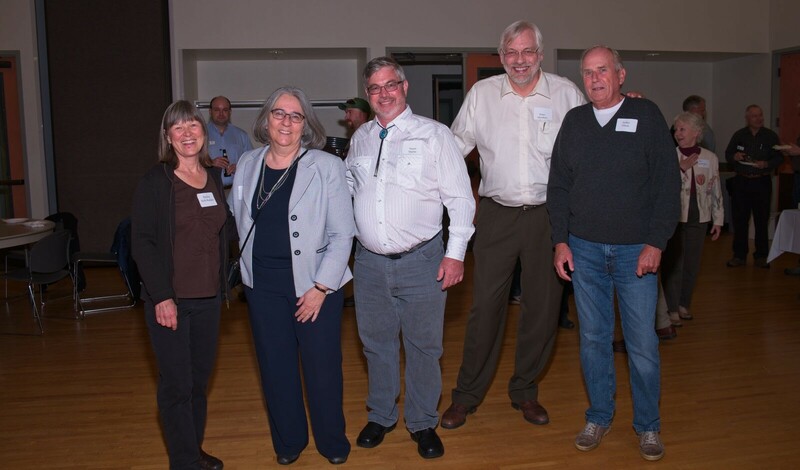 Founding Board Members, from left: Shelley Kirk-Rudeen, Paddy O'Brien, Stuart Martin, Peter Moulton, Arden Olson. Photo by Bruce Livingston. Over 80 members attended this year’s Annual Meeting, including many of the founding and early Board members, for a celebration of our 30th Anniversary. Capitol Land Trust began when a group of citizens – concerned about the potential impacts of a subdivision called Hollywoods at the base of Henderson Inlet on Woodland Creek – came together under the guidance of the national organization Trust for Public Land. The group met throughout the summer of 1987 and the land trust had its first formal meeting in November of 1987. They started working on the organization’s first two conservation projects. The land trust negotiated an agreement between the land developer and local conservation organizations over the Hollywoods subdivision. The result was 72 acres of protected saltwater wetlands and riparian area at the confluence of Woodland Creek, owned by Thurston County. This formative transaction established our culture of collaboration. The other project was the first conservation easement to be completed in southwest Washington on the 120-acre Aldridge Farm south of Millersylvania State Park. In an act of pure generosity, Mr. Aldridge donated the conservation easement to the land trust. This project launched a track record of innovation. Steve Wells, Board member from 1992 to 2004, added that the time was right for private land conservation in the 90’s. The recent critical areas ordinance had created uncertainty about how the regulatory environment would impact land values. Private land conservation became a solution for landowners seeking to protect their land, while recognizing its ecological and financial value. Ken Guza, Board member from 2000 to 2007, talked about a critical juncture for the organization. Faced with growing responsibility for the lands we promised to protect in perpetuity, the organization had to decide whether to stagnate or to grow. Luckily, they decided to grow, hired our first Executive Director, Eric Erler, and continued to protect essential natural areas and working lands. Pene Speaks, the longest-standing Board member (1997 to 2012) and longtime President of the organization, added that around the time she joined the Board, the organization embarked on its first strategic conservation plan to identify the most critical habitats in need of protection. The new plan guided the work of the organization to ensure the most valuable investments of limited resources. Today, Capitol Land Trust is a strong organization because of the leaders and members that have dedicated their time, effort, and financial contributions over the last 30 years. In 2013, we were accredited by the national Land Trust Accreditation Commission, in recognition of meeting the highest standards and practices for land trusts. We are now following the goals in our 2020 Strategic Plan, continuing our legacy of connecting people and conserving land. Thank you for all you have done for Capitol Land Trust and for your ongoing support!